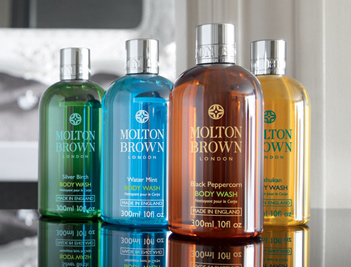 From the very heart of London, Molton Brown offers refined products for hand, body and home care inspired by Nature. It was founded in 1973 by husband and wife hairdressers who couldn’t find quality natural hair care products for their clients. With their new approach that aimed at flattering and highlighting the client’s individuality, they started creating hand-mixed products in a make-shift lab further up South Molton Street, above Browns fashion boutique. The result is a range of ultra-performing products made by rare and precious ingredients selected from all over the world to reveal the spirit of distant lands. Passion and expertise make Molton Brown products stand out for their quality and efficacy. A contemporary design, vivid colors and luxurious detailes embellish these products that will lead you through a multisensorial trip "London via the world". London is our inspiration. It makes our colors more vivid, our blends more original, our fragrances more unexpected. You will find a pinch of London in everything we do. From London we travel all over the world looking for ancient traditions, precious rituals, rare ingredients and the most beneficial raw materials. We then took them back to London, our home: here ingredients are blended together and turned to beautiful products. Join us in a multisensorial trip that will show you - through our London perspective - an unexpected glimpse on the world. We believe the environment is a precious good that everyone should contribute to preserve. For this reason, all our formulations are biodegradable. We are committed to sustainability and we constantly work to minimise the impact on environment on each level: from the extraction of raw materials, in every step of the production process to the logistics. A specific team ensures that all the necessary tests are carried out in order to guarantee prodtucts' quality and integrity. We never tested nor products or ingredients on animals and never will. All of our tests are carried out on a group of volunteers by an independent company. Our packaging is recyclable and takes part in the EU Green Dot program. Have a look at Molton Brown Italian press coverage!